Examples, solutions, videos, and worksheets to help Grade 8 students learn about alternate interior angles. 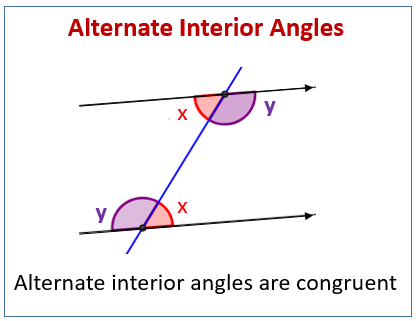 The following diagram shows some examples of alternate interior angles. Scroll down the page for more examples and solutions. This video describes alternate interior angles are and their relationship with parallel lines. How to use alternate interior angles to find the measures of angles? How to Find an Angle Using Alternate Interior Angles? A proof of the common geometric theorem showing that when lines are parallel, alternate interior angles are congruent.